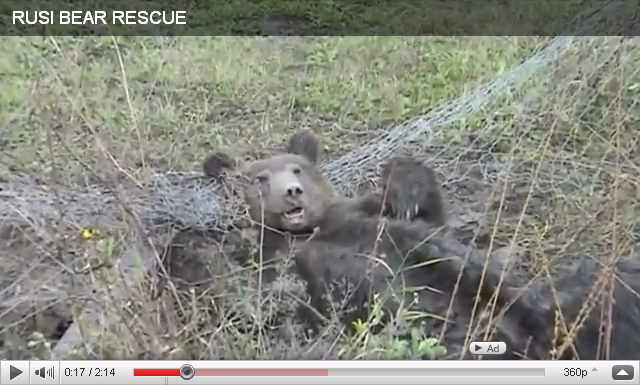 A 3 years old mail bear weighing approximately 83 kg was trapped in Central Balkan National Park on 3th November 2009. As revealed by radiotelemetry the bear spent the winter in a cave high in the mountains and in the following Spring, after the second third of March, it started going down to lower altitudes near the villages of Scobelevo and Gorno Sahrane. On 15th of October it started visiting the lowlands near the mountain foothills.On 29th we were announced by the park rangers that there was a bear caught in a snare and that probably is was the bear we had captured. We checked the data of collar and it showed that after 23:00 all locations were in this area. We left Sofia immediately and at 13:30 the bear was tranquilized. It was caught by a snare around its chest, but luckily it had only some bruises and no severe injuries. The bear was transported back to the Park territory and released. At 17:45 it stood on its 4 legs again for the first time. The snare had been set on a fence surrounding a peach tree planatation, probably with the aim to capture the bear after it had been visiting the area for at least 14 days.